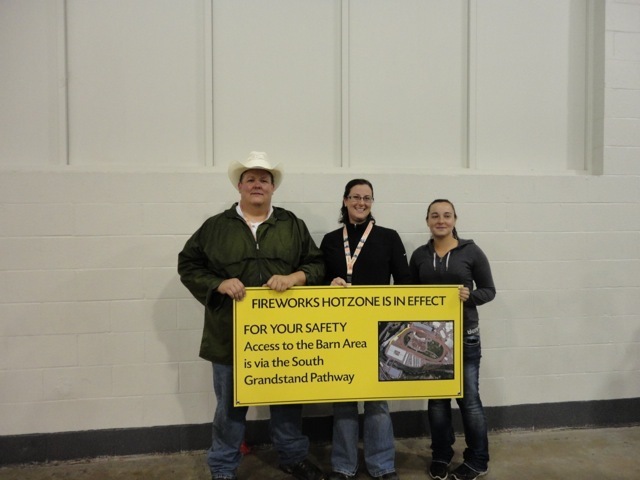 BRANDON, MB — At the end of each day, after the cowboys had wowed the record-breaking crowds, fireworks lit up the skies at Calgary’s 100th annual Stampede and two Brandon University students were on hand to ensure everyone’s safety. The fourth-year students in Applied Disaster and Emergency Services (ADES) — Greg Bartlett and Kristy Hill — were assigned positions in the launch site or “hotzone”, to oversee that all safety precautions had been taken and that rules were being followed. Bartlett discovered this chance for real-world experience through the International Association of Emergency Managers, Canadian Students’ Chapter. Bartlett is a mature student who returned to post-secondary studies after several years of working as a firefighter, a fire-training specialist and a wildfire prevention officer. Having taken a leave from her practicum — working as a volunteer fire fighter in her hometown of Warren, MB — Hill really enjoyed putting into practice the theory she learned in her ADES courses. Joining Bartlett and Hill for both weekends of the Centennial Stampede is Linda Pic, a graduate of the BU ADES program, who had previously studied atmospheric science. Originally from Virden, Pic’s focus during the Stampede was to determine if there are lightening strikes within 50 kilometres of the five fireworks launch sites — from the Stampede grounds as well as each of the city’s four corners. Her expertise lies in the monitoring of radar levels, the newest of satellite imagery as well as a specialized program from the Weather Network and Environment Canada that combines Google Earth with atmospheric lightening detection. Dr. Balfour Spence, of the ADES program at Brandon University, was thrilled to hear about Bartlett, Hill and Pic and their work at the Calgary Stampede. The 100th edition of the Calgary Stampede came to an end on July 15, at which time the remaining fireworks were set off to entertain attendees with an unprecedented 25-minute show. Throughout the Stampede, Bartlett, Hill and Pic managed their roles very well, even tackling additional tasks to help out, and made sure the viewers’ memories were wonderful ones.